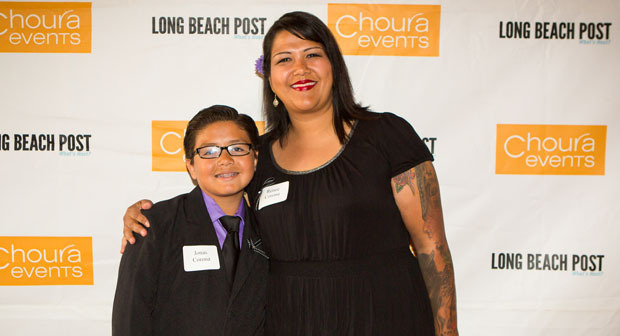 On Thursday, April 25, the Long Beach Post hosted an event to honor young people from around the city who are doing great things to better their community and beyond. Out of hundreds of nominations from our readers, judges chose 40 winners who run the gamut from educators to artists to business owners to community activists, all of whom represent just a selection of those who are today contributing to the betterment of Long Beach. Jonas Corona and his mother, Renee. For three years, Jonas has overseen the nonprofit Love in the Mirror—and he is still only 9-years-old. Since starting the organization as a way to provide those less fortunate with new socks, his organization has now expanded so that it not only has offices along 4th Street, but also provides food, clothing and other necessities across Long Beach and Los Angeles. Dubbed the “Chief of Change,” his work has inspired children and adults alike to be more cognizant of making the world more tolerant and livable.